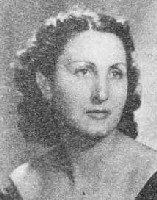 The mezzo-soprano, Raina Stoyanova, was born 4 April 1909 in Sofia. In 1932 she graduated from the Vienna State Academy of Music as a student of R. Papir. In 1931 she performed there as Luisa Miller and Madama Butterfly with the Akademie Theater Vienna. After graduation in 1932 she returned to Bulgaria and became a soloist with the Sofia Opera for the next 25 years. During this period she sang over 65 roles with this company. Her debut there was singing the role of the Innkeeper in Boris Godunov on February 10, 1933. In addition to appearing as guest soloist with the various opera houses in Bulgaria she gave numerous Lieder concerts in Vienna, Salzburg and Berlin. Major roles in her career included Marina in Boris Godunov, Carmen, Charlotte and Salambo by the Bulgarian composer Veselin Stoyanov. Massenet: Werther "Charlotte's Letter Aria"